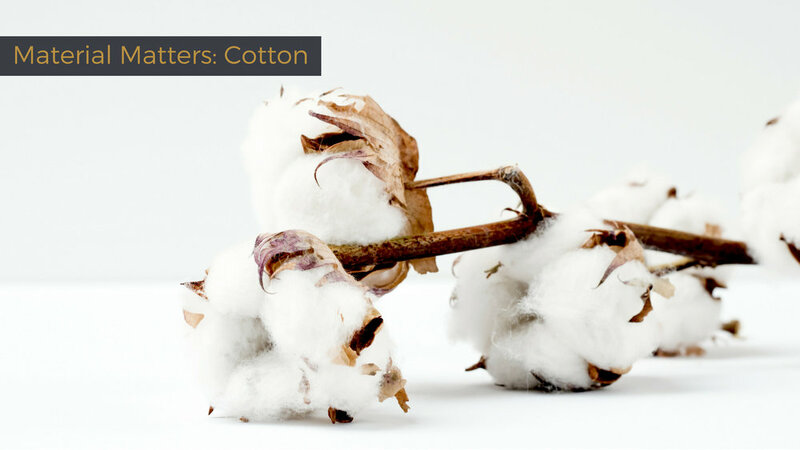 Cotton is the most commonly used material in the clothing industry. Cotton is to clothing as the wooden 2x4 is to construction, sure there are other synthetic and sturdier options, but it is far and wide the frontrunner in terms of common use. Short Staple Length: ¾ inch strands- Tend to make a softer yarn, but will pill easier. Medium Staple Length: ¾ inch to 1.25-inch strands- Most commonly used, and most abundant producing a sturdy and durable yarn. Long Staple Length: 1.5-2.5 inch strands- More durable than the medium staple length, producing longer lasting and tougher clothes that are still soft and breathable. Cotton is an interesting material because its use can vary greatly based on its staple length, weave, and finishing treatment. It can be rough, soft, strong, weak, thin, thick, warm, cool, rigid, relaxed, but it will always be breathable, wrinkle fairly easily, super absorbent (as it can hold up to 27x its own weight in water), and shrinks when exposed to high heat. So how do you pick out a well-made cotton product? Because many tags won’t tell you what staple length yarn was used, brands have come up with names to differentiate superior cotton from the rest. Pima Cotton: Named after the Pima American Indian tribe, Pima cotton is mostly grown in the US, it has an extra long staple length and is used to create stronger yarn leading to more durable, longer-lasting clothing. Supima cotton: Simply the longest Pima cotton fibers spun into yarn, leading to even more durability. Sea Island Cotton: Grown in the Carolinas, Georgia, and the West Indies Sea Island cotton is grown in a premier growing climate and cultivated in a more natural growing process resulting in a higher quality product. Sea Island Cotton is the creme of the crop when it comes to cotton and can feel more like cashmere. Egyptian Cotton: Simply means it is the longest staple length cotton in a batch, not necessarily that it is from Egypt. Cotton is very often blended with other materials, most commonly with synthetics like Polyester, Spandex (elastane), and Rayon. These blends, most specifically ones with polyester (a synthetic), make the garments cheaper to produce and provide longevity to cotton fabrics. However, while polyester lasts longer, it does not naturally breathe like cotton does, so if you see a short sleeve button down that is 80% polyester, and 20% cotton, it will not be as cool as you may think. On the other hand, the addition of spandex (usually around 2%) provides wrinkles resistance, stretch, and helps garments retain shape over time without inhibiting the fabric’s ability to breathe. Pretty much everything. Apparel (like shirts, canvas shoes, shorts, pants, hats, coats, suits, etc. ), painting (canvas), currency, furniture, and more. Wash less if possible, air dry the light stuff, use white vinegar on the more delicate cotton pieces, separate loads by type, weight, and color to avoid color and garment deterioration. Avoid shrinking by removing articles from your dryer while they are still damp. Stay tuned for more articles on the materials we interact with everyday because when it comes to what you wear, material matters.